Not In The Program Yet? Welcome to the LampRecycling.com blog. Here you can find the latest industry and company news, read expert opinions on a variety of topics, and see other unique items that catch our attention. Feel free to join the conversation! 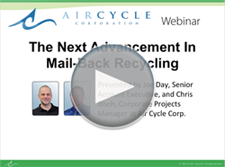 Mail-back recycling isn't usually known for innovation, but in the webinar Air Cycle's Joe Day and Chris Risch discuss how Air Cycle Corporation's EasyPak™ program changes that with the introduction of the streamlined VaporShield® box design, addition of new containers to the product line and a new, easy-to-use Sustainable Program online interface. The next advancement in mail-back recycling is here...watch or download this free webinar to learn more!